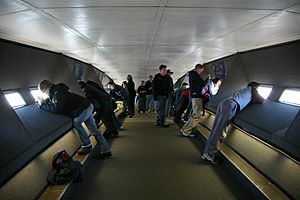 The windows of the observation deck are located around the apex of the arch. Both the width and height of the arch are 630 feet (192 m). 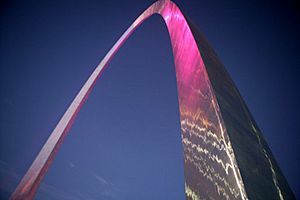 The arch is the tallest memorial in the United States and the tallest stainless steel monument in the world. 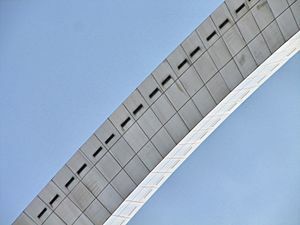 The cross-sections of the arch's legs are equilateral triangles, narrowing from 54 feet (16 m) per side at the bases to 17 feet (5.2 m) per side at the top. Each wall consists of a stainless steel skin covering a sandwich of two carbon-steel walls with reinforced concrete in the middle from ground level to 300 feet (91 m), with carbon steel to the peak. The arch is hollow to accommodate a unique tram system that takes visitors to an observation deck at the top. The structural load is supported by a stressed-skin design. Each leg is embedded in 25,980 short tons (23,570 t) of concrete 44 feet (13 m) thick and 60 feet (18 m) deep. Twenty feet (6.1 m) of the foundation is in bedrock. The arch is resistant to earthquakes and is designed to sway up to 18 inches (46 cm) in either direction, while withstanding winds up to 150 miles per hour (240 km/h). The structure weighs 42,878 short tons (38,898 t), of which concrete composes 25,980 short tons (23,570 t); structural steel interior, 2,157 short tons (1,957 t); and the stainless steel panels that cover the exterior of the arch, 886 short tons (804 t). This amount of stainless steel is the most used in any one project in history. The base of each leg at ground level had to have an engineering tolerance of 1⁄64 inch (0.40 mm) or the two legs would not meet at the top. 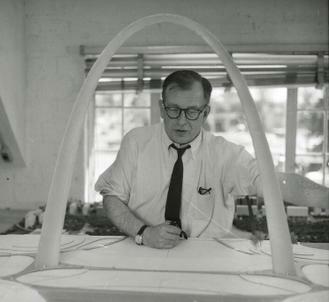 The first proposal to illuminate the arch at night was announced on May 18, 1966, but the plan never came to fruition. In July 1998, funding for an arch lighting system was approved by St. Louis' Gateway Foundation, which agreed to take responsibility for the cost of the equipment, its installation, and its upkeep. 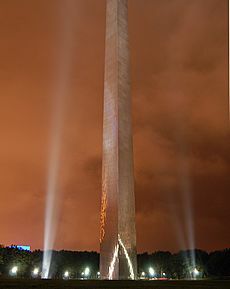 In January 1999, MSNBC arranged a temporary lighting system for the arch so the monument could be used as the background for a visit by Pope John Paul II. Since November 2001, the arch has been bathed in white light between 10 p.m. and 1 a.m. via a system of floodlights. Designed by Randy Burkett, it comprises 44 lighting fixtures situated in four pits just below ground level. On October 5, 2004, the U.S. Senate, at the pressing of Senators Jim Talent and Kit Bond, approved a bill permitting the illumination in pink of the arch in honor of breast cancer awareness month. Both Estee Lauder and May Department Store Co. had championed the cause. One employee said that the arch would be a "beacon ... for the importance of prevention and finding a cure." While the National Park Service took issue with the plan due to the precedent it would set for prospective uses of the arch, it yielded due to a realization that it and Congress were "on the same team" and because the illumination was legally obligatory; on October 25, the plan was carried out. The previous time the arch was illuminated for promotional purposes was on September 12, 1995, under the management of local companies Fleishman-Hillard and Technical Productions when a rainbow spectrum was shone on the arch to publicize the debut of Ringling Bros. and Barnum & Bailey Circus' Wizard of Oz on Ice at the Scottrade Center (then named the "Kiel Center"). In April 1965, three million tourists were expected to visit the arch after completion; 619,763 tourists visited the top of the arch in its first year open. On January 15, 1969, a visitor from Nashville, Tennessee, became the one-millionth person to reach the observation area; the ten-millionth person ascended to the top on August 24, 1979. In 1974, the arch was ranked fourth on a list of "most-visited man-made attraction[s]". The Gateway Arch is one of the most visited tourist attractions in the world with over four million visitors annually, of which around one million travel to the top. The arch was listed as a National Historic Landmark on June 2, 1987, and is also listed on the National Register of Historic Places. On December 8, 2009, sponsored by nonprofit CityArchRiver2015, the international design competition "Framing a Modern Masterpiece: The City + The Arch + The River 2015" commenced. It aimed to "design a plan to improve the riverfront park landscape, ease access for pedestrians across Memorial Drive and expand onto the East St. Louis riverfront," as well as to lure visitors. The contest consisted of three stages—portfolio assessment (narrowed down to 8–10 teams), team interviews (narrowed down to 4–5 teams), and review of design proposals. The competition received 49 applicants, which were narrowed down to five in the first two stages. On August 17, 2010, the designs of the five finalists were revealed to the public and exhibited at the theater below the arch. On August 26, the finalists made their cases to an eight-member jury, and on September 21, the winner was revealed—Michael Van Valkenburgh Associates. The initiative's plans include updating Kiener Plaza and the Old Courthouse, connecting the city to the Arch grounds with a park over Interstate 70, a re-imagined museum and improved accessibility. The budget for the project is $380 million and is set to be completed in 2018. Ground broke on the 'Park over the Highway' project, the first component of the CityArchRiver project, on August 2, 2013. This project features a landscaped structure over Interstate 70 and rerouted surface traffic that had previously formed a moat separating the Gateway Arch from the Old Courthouse.This project was completed in November 2015. The underground visitor center for the arch was designed as part of the National Park Service's Mission 66 program. The 70,000-square-foot (6,500 m2) center is located directly below the arch, between its legs. Although construction on the visitor center began at the same time as construction for the arch itself, it did not conclude until 1976 because of insufficient funding; however, the center opened with several exhibits on June 10, 1967. 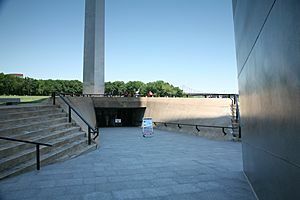 Access to the visitor center is provided through ramps adjacent to each leg of the arch. 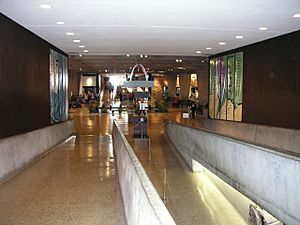 The center houses offices, mechanical rooms, and waiting areas for the arch trams, as well as its main attractions: the Museum of Westward Expansion and two theaters displaying films about the arch. The older theater opened in May 1972; the newer theater, called the Odyssey Theatre, was constructed in the 1990s and features a four-story-tall screen. Its construction required the expansion of the underground complex, and workers had to excavate solid rock while keeping the disruption to a minimum so the museum could remain open. The museum houses several hundred exhibits about the United States' westward expansion in the 19th century and opened on August 10, 1977. 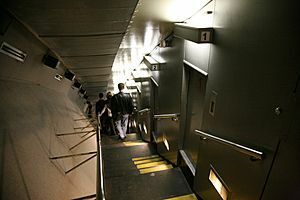 Near the top of the Arch, passengers exit the tram compartment and climb a slight grade to enter the observation area. This arched deck, which is over 65 feet (20 m) long and 7 feet (2.1 m) wide, can hold up to about 160 people, four trams' worth Sixteen windows per side, each measuring 7 by 27 inches (180 mm × 690 mm), offer views up to 30 miles (48 km) to the east across the Mississippi River and southern Illinois with its prominent Mississippian culture mounds at Cahokia Mounds and to the west over the city of St. Louis and St. Louis County beyond. There are three modes of transportation up the arch: two sets of 1,076-step emergency stairs (one per leg), a 12-passenger elevator to the 372-foot (113 m) height, and a tram in each leg. Each tram is a chain of eight cylindrical, five-seat compartments with a small window on the doors. As each tram has a capacity of 40 passengers and there are two trams, 80 passengers can be transported at one time, with trams departing from the ground every 10 minutes. The cars swing like Ferris-wheel cars as they ascend and descend the arch. This fashion of movement gave rise to the idea of the tram as "half-Ferris wheel and half-elevator." The trip to the top takes four minutes, and the trip down takes three minutes. Because of a lack of funds in March 1962, the NPS did not accept bids for the arch's internal train system and considered discarding the idea. In May 1962, the Bi-State Development Agency proposed that it issue revenue bonds to obtain the required funds. The Department of the Interior and Bi-State entered into an agreement where Bi-State would construct and operate the tram. Bi-State would have to raise $1,977,750 for the construction of the tram system. It retired the bonds by setting a $1 riding fee to the top. Two months later, the agency had already received 45 advance reservations for seats on the tram. Bi-State put in $3.3 million revenue bonds and has operated the tram system since. The tram in the north leg entered operation in June 1967, but visitors were forced to endure three-hour-long waits until April 21, 1976, when a reservation system was put in place. The south tram was completed by March 1968. Commemorative pins were awarded to the first 100,000 passengers. As of 2007, the trams have traveled 250,000 miles (400,000 km), conveying more than 25 million passengers. Built as a monument to the westward expansion of the United States, the arch typifies "the pioneer spirit of the men and women who won the West, and those of a latter day to strive on other frontiers." The arch has become the iconic image of St. Louis, appearing in many parts of city culture. In 1968, three years after the monument's opening, the St. Louis phone directory contained 65 corporations with "Gateway" in their title and 17 with "Arch". Arches also appeared over gas stations and drive-in restaurants. In the 1970s, a local sports team adopted the name "Fighting Arches"; St. Louis Community College would later (when consolidating all athletic programs under a single banner) name its sports teams "Archers". Robert S. Chandler, an NPS superintendent, said, "Most [visitors] are awed by the size and scale of the Arch, but they don't understand what it's all about.... Too many people see it as just a symbol of the city of St. Louis." 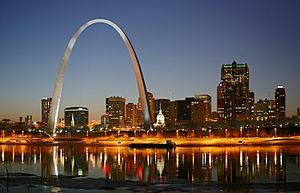 The arch has also appeared as a symbol of the State of Missouri. A special license plate designed by Arnold Worldwide featured the arch, labeled with "Gateway to the West." Profits earned from selling the plates would fund the museum and other educational components of the arch. The arch is a weighted catenary—its legs are wider than its upper section. 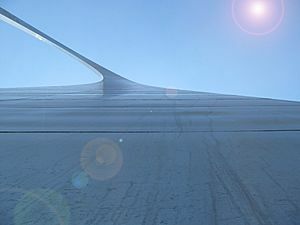 Welds on the arch's skin seal gaps between 4-by-8-foot sheets of stainless steel. Graffiti is scratched on the lower five to seven feet of the monument. Gateway Arch Facts for Kids. Kiddle Encyclopedia.